Pasta is probably the most popular food in the world and with a pasta machine it can be made in the comfort of your own home. Even novice chefs can attempt homemade pasta—the recipe consists of just four ingredients. All you’ll need are eggs, flour, water, and salt. Now, quality is important when it comes to selecting ingredients for any dish. This is especially true of recipes that require fewer ingredients. In this guide, you’ll learn all about the different types of pasta flour. We’ll go into detail about what flour is and how it’s used to make pasta. Finally, we have recommended five of the best flours on the market for preparing delicious homemade pasta. Flour is starch or grains from plants that have been ground into powder. It’s an essential component in baked goods, many kinds of sauces, and so much more. Flour’s versatility is due to the way it responds to water. Mixing water with flour converts the protein in flour into gluten. In turn, this allows the dough to be elastic and able to retain gas. This ability to hold gas results in the dough expanding. In baked goods, this is what causes cakes, breads, and cookies to rise in the oven. This is also what makes flour a helpful thickening agent. It gives body and texture to thin sauces and soups. The more protein the flour contains, the more gluten your dough will have. For example, crackers, pie crusts, and cookies don’t need much structure. Lower-protein flour would be suitable for these recipes. Contrastingly, bread and rolls do need more support. If you use a flour that doesn’t have enough protein, they may not expand enough during the baking process. There are two factors that contribute towards the consistency and texture of flour. The first is the plant source. The grains or starches of different plants can vary significantly. Wheat-based flour is the most common type of flour available today. However, it can also be made from buckwheat, oats, and barley. Chickpeas, lima beans, soybeans, and rice can also be used. The second factor that plays a role is the milling process. In the past, milling flour involved manual labor and a lot of patience. Nowadays, milling processes can vary, depending on the type, and even the brand, of flour. It can be tricky to choose the best flour for making pasta. Before we begin talking about specific brands, let’s start with the basics. There are four broad categories of flour. You’ll learn about the unique characteristics of each one, and how they’re made. We’ll also detail what makes each flour fitting—or not—for making pasta. All-purpose (AP) flour is exactly what it sounds like. It can be used in almost any recipe that calls for flour. This is the flour that many of us have in our pantries. This flour is usually milled from so-called hard wheat. It can also be a mix of soft and hard wheat. The protein content determines the softness or hardness of wheat. The harder a wheat is, the more protein it contains. The majority of AP flours have a protein content of between eight and 11 percent. This can differ, depending on the individual brand. As we covered earlier, protein in flour is related to gluten in dough. 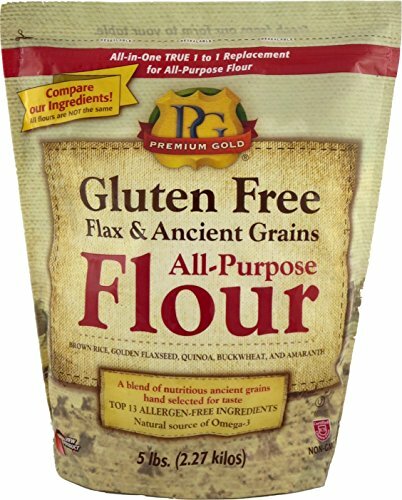 AP flour is in the mid-range for gluten content. After all, this flour is designed to be versatile. Does this mean that this flour is a good choice to make pasta? The answer is yes. You’re not obligated to use a pasta-specific flour. Many recipes for homemade pasta call for AP flour. It’s neither too high nor too low in gluten, offering a mid-level texture. The end result is pasta that won’t be too chewy or too soft. AP flour has the added benefit of being on the lower end of the price scale. This type of flour can be found in almost any store and has a long shelf life. Double zero flour originates from Italy. It’s also known under its Italian name, doppio zero flour. In Italy, flour is classed according to how finely it is milled. For example, integrale flour is milled from the whole grain in its entirety. Tipo 2 is right below it, using approximately 85 percent of the grain. There are two more flours, Tipo 1 and zero. Double zero flour is on the opposite end of the scale from integrale. It is extremely fine flour, with the consistency of powder. The smaller the flour particles, the less protein they contain. As double zero flour is one of the finest flours there is, it contains very little protein. Pasta prepared from this flour will have a very smooth consistency. The gluten content is generally low, meaning you should not expect thick or chewy pasta. Double zero flours are for rather specific recipes—like pasta, in particular. One brand may be more appropriate for making pasta than another. Many will indicate suggested uses on the package. Lots of pre-made pastas are made from double zero flour. However, you should prepare for a higher price tag—this flour does not come cheap. Semolina flour is made from durum, a type of hard wheat. It’s coarse and heavy, and very thick in consistency. Rather than being powder-like, it resembles sugar grains. It is golden in color, instead of the traditional white AP flour. Because of the way it’s milled, it has a high protein (and, of course, gluten) content. Semolina flour is also low in moisture. This will make for a clay-like dough, that can be easily molded. Semolina-based pasta can be traced back to 17th century Italy. This flour is still a main ingredient in commercially available pastas today. Pasta dough made from semolina will be thick and won’t crumble. The pasta pieces will keep their shape without falling apart when handled. Your pasta will have a thicker texture and a heartier taste with this coarse flour. Gluten-free flour is an option for those of you who are gluten intolerant. These types of flour come in many variations. Some are also suitable for people on grain-restrictive diets, such as paleo or keto. You can purchase traditional grain-based flours that are gluten free. These flours have undergone unique processing to have the gluten removed. For a less processed option, you can choose flour prepared from non-grain starches. For example, flour made from almonds, rice, or coconut. No two gluten-free flours are alike. Certain types are better in baked goods, whereas others work best in sauces. For pasta dough, you have a few options. Amaranth flour is seed based. It is rich in protein and has an interesting, nutty flavor. This flour will make for thick, chewy pasta. Bean flours tend to have a fine, powder-like consistency. You can use them for softer textured, smoother pasta. You have plenty of variations to choose from: soybean, lima bean, black bean, and more. Buckwheat flour can be used to make distinctive-tasting pasta. Despite the name, buckwheat produces seeds rather than grains. It has a heavy, earthy taste to it. You can mix and match to create your ideal pasta dough. There are recipes for gluten-free pasta that may call for more than one type of gluten-free flour. Homemade pasta recipes can be adapted to be eggless. For the vegans out there, you can make eggless pasta with a few flours. You won’t need anything more than the core ingredients—water, flour, and salt. You can also use a vegan-friendly egg substitute. There are commercial products available. Alternatively, you can use all-natural substitutes. Unfortunately, many of these substitutes are more appropriate for baked goods. Applesauce, bananas, and other popular choices might not work with pasta dough. In pasta dough, eggs are known as binders. This means that they help the dough to stick together. All we have to do is adapt how the flour and water mixes together. Contrary to popular belief, eggs are not an absolute requirement to make pasta. All you need to do is make sure the dough stays moist. You’ll have to increase the amount of water you use. It’s also best to use lukewarm water, rather than cold. For example, let’s say you are using all-purpose (AP) flour. Keep the ratio to two cups of AP flour to half a cup of water. The same balance applies to semolina flour. As you knead the dough, take care to add flour or water as needed. If your dough is dry and crumbly, add a few more drops of water. If your dough is too wet, just sprinkle in more flour. You can apply the same concept to grain-based, gluten-free flours. They should behave the same way as their gluten-containing counterparts. This double-zero Italian wheat flour is free of additives and can be used for gnocchi as well as pasta. It contains between 11.5 and 12.5 percent gluten. Molino’s flour has been slow ground to avoid heat damage. A slower grinding process also allows the wheat to retain as many nutrients as possible. The flour is so fine that it feels almost like a liquid rather than a solid. It forms pasta dough of a smooth consistency. The dough will be stretchy, elastic, and easy to knead and form. This is particularly useful if you’re not used to handling dough. You can make delicate raviolis or plain spaghetti. Either way, this flour simplifies the process for chefs of all levels. You can expect your pasta to come out light and smooth. Even without sauce or seasoning, the taste will still be rich and hearty. As with most double-zero flours, this is a pricey product. However, you’ll be getting what you pay for. This flour is as good as restaurant-quality in taste and texture. You have a choice between bag sizes of five, nine, and 12 pounds. If you order a five-pound bag, it will come in a clear plastic bag packaged inside a box. The larger quantities come in branded paper bags. Pasta comes out smooth and light. Can be used for gnocchi too. If you order a small quantity, it will come in a plastic bag rather than paper. 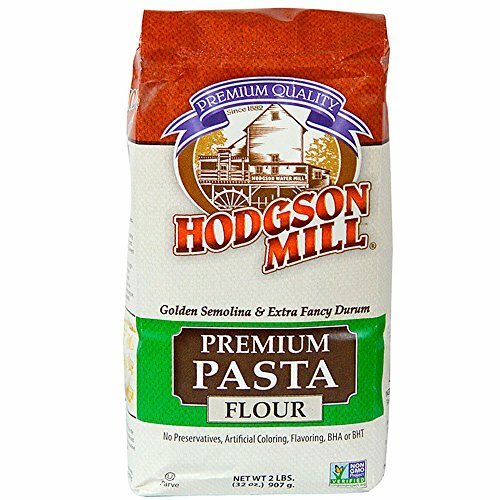 Hodgson Mill pasta flour is a blend of semolina and durum flours. There are no preservatives or artificial ingredients of any sort in this flour. It’s also kosher and non-GMO. This flour is wholly organic and has a naturally white color. It’s not bleached or subject to any processing whatsoever. This is ideal for those of you who may be more sensitive to heavily processed flours. Additionally, Hodgson’s premium flour is unbromated. Bromide is a type of preservative that many flours on the market contain. Even a brand of flour that claims to be preservative free may still contain bromide. The flour feels coarser than you would expect, considering how fine it is. It’s not difficult to knead and roll out, unlike some other semolina flours. This golden flour will produce pasta dough that holds its shape well. Even if passed through a pasta roller, the dough will not break. You can expect dough with a sturdy texture. The final product will be tender, smooth pasta. Even though this is coarse flour, you don’t have to worry about a “grainy” consistency. Ordering it online, you’ll receive six bags of two pounds each. After you open a bag of flour, you should keep it in the fridge. Hodgson’s flour is on the upper end of the price scale, but this is to be expected of unbleached, organic flour. There is one precaution you must take. Be sure to store the bags correctly, as this flour tends to attract pests. Always keep bags refrigerated or in airtight containers. Natural, non-GMO, organic flour suitable for almost everyone. Prone to insect infestations if not stored carefully. 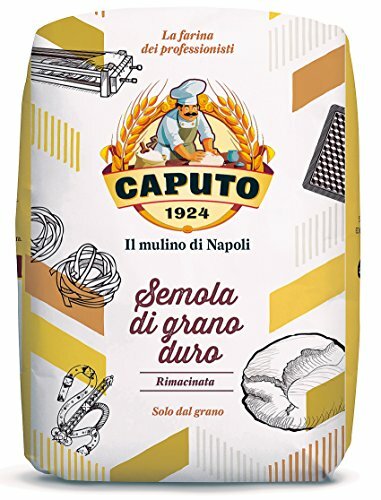 Molino Caputo’s semola flour is additive free. It can be used for pasta, pizza dough, and baked goods. Made from durum wheat (a hard wheat), it’s similar to semolina flour. However, instead of being coarse, it’s ground finely. The word “rimacinata” is the Italian word for “twice milled.” This results in a finer, powder-like flour. 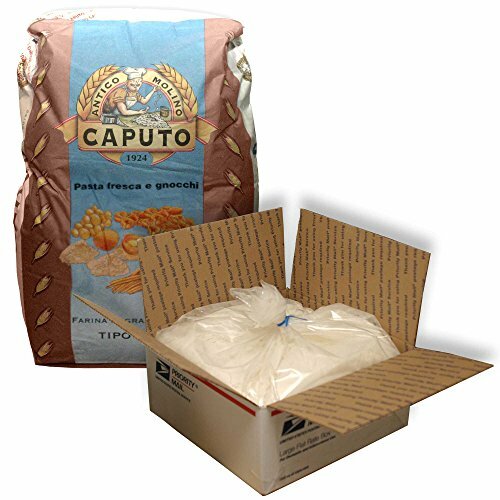 As with the other Caputo flour on this list, it undergoes a slow milling process. This allows the flour to stay moist and retain its nutrients. This fine flour will make you a non-sticky, malleable dough. Culinary novices will find the dough simple to form and knead. You’ll also benefit from a lot of elasticity in this dough. It’s difficult to accidentally tear it or ruin your pasta’s shape. In turn, your pasta will be silky smooth with a chewy bite to it. The texture this flour provides is very distinctive. This flour also infuses the pasta with a rich flavor. You can pair this pasta with discrete sauces, such as olive oil and garlic. You don’t even have to use eggs. Mixing the semolina flour with water and salt alone will yield good results. This is a good option for vegans who don’t want to use eggs or egg substitutes. One downside of this flour is the price and quantity. The bag is small considering the price. Can be used for other dishes besides pasta. Bob’s Red Mill semolina pasta flour is sandy and coarse. It’s nutritionally enriched, containing many minerals and vitamins. These include thiamine, iron, riboflavin, folic acid, and niacin. Be careful if you have allergies to nuts, milk, or soy. This flour states that it’s produced in a facility that uses these items. This semolina flour is stout enough to be used without eggs. You can prepare thick, stiff dough with minimal water. Due to its sandy texture, it retains moisture well. Because of this moisture-retaining property, it may take longer for your pasta to dry. Pasta made with this flour will have a noticeable flavor, even plain. The golden color of the flour results in classic yellow pasta. 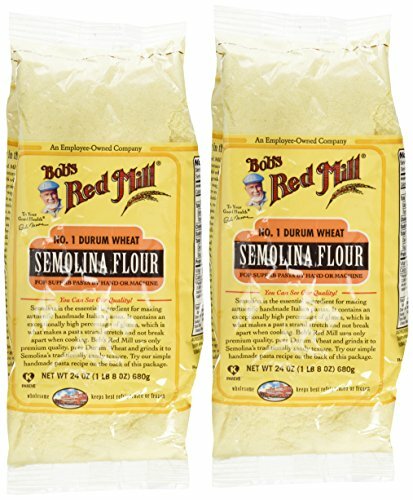 Bob’s Red Mill flour is less expensive than Italian semolina flours. It’s also a decent quantity (three pounds) for the price. Less costly than Italian semolina flour. Retains moisture for tasty, rich pasta. May take longer for your pasta to dry. Processed (it is artificially enriched with nutrients). May not be suitable for those who are sensitive to nuts, milk, or soy. This is an AP flour that’s free of gluten. It doesn’t contain additives, preservatives, or allergens. This brand is also non-GMO as well as kosher. You can use Premium Gold’s AP flour for pasta and much more. It’s crafted to be similar in texture and taste to wheat-based AP flours. This means that you can use it as you would use a wheat-based AP flour. You will not have to substitute or adapt portions for recipes. There are five gluten-free flours in this formula. They include quinoa, buckwheat, amaranth, brown rice, and flaxseed flours. This unique mix is also high in nutritional value. Despite the blend of ingredients, the flour does not have an overpowering taste. Your pasta will not have an undertaste of amaranth, quinoa, or anything else. You will benefit from omega-3, fiber, and protein. This means it’s much better for you than standard wheat-based AP flour. When it comes to pasta dough, a little goes a long way. The flour is elastic—almost gummy—and easy to knead. Premium Gold comes with a high price tag for a five pound package. However, it’s a versatile flour and suitable for special dietary needs. If you cannot tolerate gluten, this is the best option. Organic and non-allergenic, suitable for almost everyone. Tastes exactly like wheat-based all-purpose flour. How Is Flour Used to Make Pasta? We have established that flour is needed for form. Pasta begins with pasta dough—and without flour, there cannot be dough! You just need the four ingredients: flour, water, eggs, and salt. The quantity of ingredients will vary depending on how much pasta you want to make. Don’t forget to adapt portions, based on the type of pasta you are making. You’ll need more dough the larger your pasta is (e.g. tagliatelle). Mix the flour, water, egg and salt. You can add the eggs and water to the flour directly and mix with your fingers. You can use a fork or spoon if you prefer. Once the dough is firm and stiff, get to work kneading. It’s preferable to sprinkle flour on the surface you will be kneading on. This prevents the dough from sticking to it. Certain types of flour produce more malleable dough than others. If your dough is very stiff, kneading can be hard work. Don’t worry, this is the most difficult stage of the process. Once thoroughly kneaded, roll the dough out to your desired thickness. When you’re satisfied, you have two options. You can either use a pasta machine or pieces out for your pasta by hand. Over time, you can experiment with other tips and techniques. Some recipes will suggest that you leave the dough to rest before making pasta. This involves sitting it in the fridge for an hour or more. What Is the Right Pasta Flour for Me? The right pasta flour can differ from person to person. Special dietary needs and personal preferences play a role. Taking into account your individual needs, keep one rule in mind. It is always better to choose a brand of flour that’s intended for making pasta. Regardless of the type (e.g. double zero) check the suggested uses. This serves a dual purpose. First of all, you know the flour has been crafted to suit pasta making. Secondly, the flour container will likely include helpful tips for pasta dough recipes. Feel free to try out different flours to find one that works for you. Practice makes perfect when it comes to mastering homemade pasta. Older PostZiti vs Penne - What’s the Difference?